New FishDuck.com GIF! They laughed at Oregon’s Uniforms? For those of us who are Greybeards, we remember vividly the epithets and humor directed at Oregon when we began to change our uniforms. Now, truth be told, I am an old fuddy-duddy who would still have them wearing the same uniform from 1983 (I LOVED that stripe on the helmet and the thin stripe on the leg!). Yet I love my team and will support them no matter what they wear … even if they wear the hideous yellow uniforms of 2003 (above). Like so many fans, I adjusted and have come to love the changes, to the point where I now can’t wait to see this week’s combo. 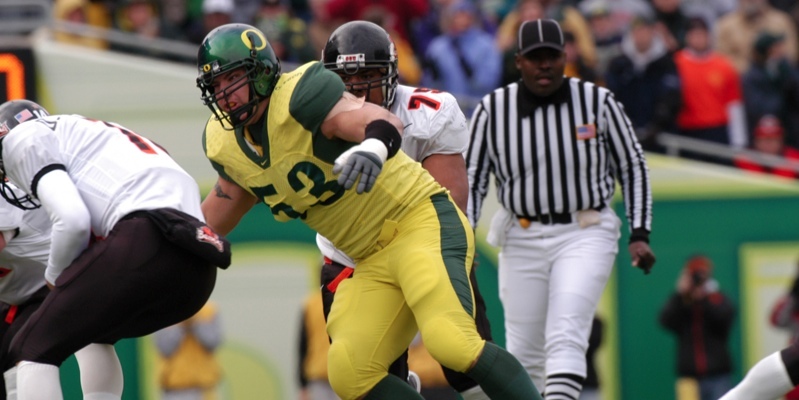 If the first uniform change was before your time as an Oregon fan, you cannot believe the national screaming about Oregon that took place. EVERY national publication debated the change away from the traditional uniforms by Oregon and how ugly the new ones were. The Ducks would win polls of the ugliest as well as the coolest uniforms so often that it has just became a part of our national brand. It has been 15 years from the first major change (1999) to today, but it truly has taken that long for the acceptance and then the convergence of the major college programs around the nation to copy the Oregon example. I simply cannot convey the outcry around the nation and the ridicule that opposing teams’ fans tried to project onto us for so long. It went from universally terrible reviews to where now EVERY team seems to be following the Oregon blueprint, as they have with the “No-Huddle” offense. Below is a GIF created by University of Oregon student Peng Xu for FishDuck.com depicting the change of attitude toward the black uniform by even a few of the more traditional schools, including an SEC team! Enjoy. Great GIF by Peng Xu!